Channeling Fire and Water to create a Heavy Load! Sometimes albums arrive totally unsolicited and lay in my ‘to do box’ for months before ending up in a charity box and that was very nearly the fate for this album. Old Glory and the Wild Revival arrived as a ‘white label’ with only a postcard featuring the Molly Hatchet meets Peter Frampton style album cover on it, and no press release. Normally I can’t be arsed to research artists when this happens; sorry but I receive 5 or 6 albums a week and life is too short for that nonsense. Yet something persuaded me to put it in the box for the car. Boy! Am I glad I did. Playin’ For Keeps opens the album and is a bit louder than my normal tastes these days; but there was ‘something’ about it that held my attention. Half way through track #3 Let You Go, the first cherry dropped into place! I don’t know much about music but I do know the sound of my favourite guitar in the world; the Gibson Les Paul being played within an inch of its life and this boy can seriously play. Then; during track #7 All Your Pain the second and third cherries clicked into place and I hit the jackpot – JJ Nichols singing style is not unlike Paul Rogers circa 1970 and those guitar licks……a Paul Kossoff devotee if I’m not mistaken! 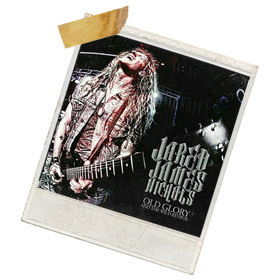 There you have it – I was listening to the great ‘lost’ Free album that never got recorded only Jared James Nichols is keeping the flame alive in 2015. Much like the most underrated Rock band in history; Nichols straddles the Blues and Rock with permanent ease as he sings from not just the heart but deep in his Rock ‘n Roll Soul. His guitar playing is right up my Strasse; slow, choppy and very dirty. The mechanics would be nothing without songs; and Nichols can write a song like the Masters; Sometimes is a blast while earlier Haywire shows great restraint as his voice is mixed two notches above some scorching guitar licks. While I absolutely love the slow Delta Blues of finale Come in My Kitchen which really showcases the Son of Wisconsin’s voice and dextrous skills on a Resonator guitar; my favourite track is the one that precedes it – Take My Hand. The track opens with a slow and seedy acoustic Blues and slowly builds and burns into a real old fashioned headbanger. My copy features two ‘bonus tracks’ from his debut EP ‘Live at the Viper Room’ and you can virtually taste and smell the sweat and adrenaline being produced on every note. Sometimes the stars align and bring a bit of luck into your life; this album did for me and I’m pretty damn sure it will for Jared James Nichols.